We start solving mysteries from early on. Most toddlers play with some kind of shape sorting – working out that the square block fits through the square hole. Perhaps then moving onto jigsaw puzzles – at first the large ones with sticking up handles, and then finally the traditional puzzles, creating pictures of Disney heroines or maps of the world. All this goes towards child development in developing the gross and fine motor skills of course, but solving puzzles enables a child to hone memory, use logic and refine observation skills, and to sort the red herrings from the real clues. Then eventually, putting pen to paper, children may tackle a spot the difference, a wordsearch, a crossword, a su doku. What’s satisfying about these tasks is that by solving the problem, a child is restoring order at the end – bringing closure to the problem, much in the same way that authors end children’s books – with uplifting closure. And the same applies to reading a detective or mystery story. Enid Blyton used to be the doyenne of such spiels – her Secret Seven and Famous Five solving mystery after mystery. Scooby Doo followed on TV, and we became a nation of child detective experts. Mysteries force the reader or viewer to hold information in their head, whilst following the story and working out critically where the story is headed – analysing characters for motive and honesty. In contemporary children’s literature the depth and breadth of mystery stories is quite astounding; more and more of these land on my desk every day. “Thousands of books, from the floor to the ceiling. The books gave the thief the most heavenly feeling. 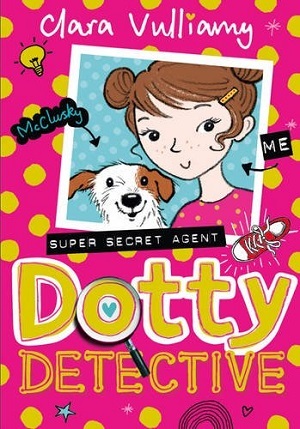 For newly independent readers, Clara Vulliamy’s offering, Dotty Detective, fits the bill beautifully. Filled to the brim with illustrations, capital letters, italics, and written in a clearly paced diary format, this is the story of Dot, a little girl with more personality than doodles in the book. The text reads breathlessly – Dot talking to the diary – and soon she forms a detective agency with her school friend and faithful dog. There are some lovely ideas tucked in here, from the pink wafer code to homemade periscopes – lots of references to what’s important to this age group – sparkly red lucky shoes and yummy dinners, and enough dropped clues that the young reader can solve the mystery ahead of Dot. This is a perfect step up from picture books – the number of maps, illustrations, fake photographs, notes and even word searches mean that this is a story that lends itself as much to visual literacy as to textual. Seek the first in the series here. Another diary format, and more mysteries in this historical book from Julia Lee. 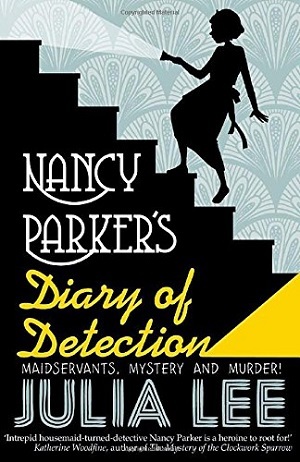 It is the 1920s and Nancy Parker has been employed as a housemaid for her first job. She has a penchant for reading six-penny thrillers, and wants to be a detective, so she seeks our mystery where she can. And luckily for her, there does seem to be some strange activity from her new employer – she has lavish parties, a murky past and a cook with a secret. Add to that a spate of local burglaries, and Nancy’s detective skills are put to use. There’s a lovely rounded cast here, from the boy next door – Quentin Ives who wishes he was a dashing undercover spy called John Horsefield, but is really rather a nincompoop, and Ella, the brave and daring daughter of a local archaeologist. The three children are thrown together in solving the mystery, and although reluctant at first, realise that they are stronger together. This book is full of wry comic fun, and great characters. Each child is so well painted, so thoroughly flawed and yet likeable that the reader will never tire of reading of their adventures (albeit there is no massive mystery to solve in the end). Partly written as Nancy’s diary in stunning handwritingish typeface, and partly in third person prose from the different children’s points of view, this was a really enjoyable read with great historical detail. Highly recommend. For 9+ years. Buy it here. Far more contemporary, Alice Jones is presented as a bit of a whizz kid. She excels at maths, and has a reputation for solving mysteries before the story begins. When a famous scientist goes missing after reputedly inventing an invisibility suit, Alice has to work out how to find him, at the same time as protecting her friends. Alice is a great character, not merely a Nancy Drew who only solves mysteries, but someone with a life outside, including school, friends and family. She is clever but displays dry humour, and develops well during the novel, realising that classroom troublemaker Kevin Jordan may work as a good ally in problem solving. She also has to deal with her home life – a family that needs some problem-solving too. 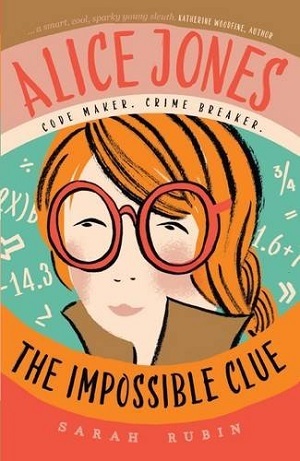 The story is set in Philadelphia and there are definite Americanisms throughout, but the hardest task was solving the mystery – readers will need to be steered thoroughly by Alice – there is none of the blatant clue-dropping as in the titles above, where the reader learns more than the protagonist. However, it’s great to see a heroine deciphering clues with her intelligence rather than random flashes of intuition, and it makes for a gripping read. Age 10+ years. Buy it here. 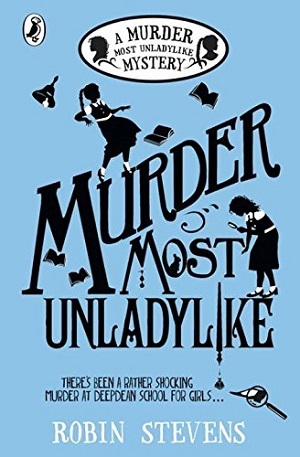 The Wells and Wong Mysteries, starting with Murder Most Unladylike by Robin Stevens is one of my favourite series. Set in the 1930s, it mashes Agatha Christie mysteries with Enid Blyton boarding schools. 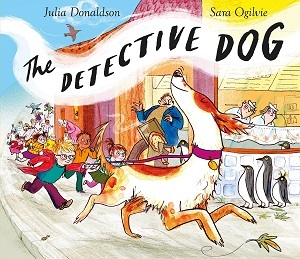 In the first in the series, Daisy and Hazel set up a detective agency in their school to look for missing ties and suchlike, but then stumble across the body of the science mistress lying dead in the gym. Suddenly they have a real mystery to solve. A brilliant story, complete with boarding school rules and regulations, but also the twist of a murder to solve. Great gentle fun; if you haven’t discovered them yet, you’re in for a treat. Seek it here. 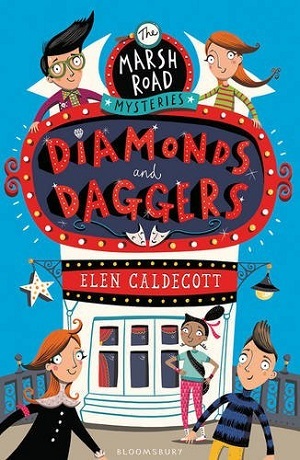 The Marsh Road Mysteries, starting with Diamonds and Daggers by Elen Caldecott. This series, all set in the same street with the gang of children who live there is reminiscent of Emil and the Detectives simply because the setting is almost as much a part of the story as the mystery itself. Caldecott is a very skilful writer, and hops from head to head in the narrative, so that each child’s viewpoint is seen. The first book in the series tells the story of a missing diamond necklace – a famous actress comes to the local theatre, but when her necklace goes missing, the prime suspect is one of the local children’s dads. Piotr has to fight to find out who really did it to avoid being sent ‘home’ to Poland with his security guard Dad. Each character is well defined; and the readership will adore the familiar territory of friendships and loyalties as the series progresses. Compelling and really vibrant – a modern day Famous Five (but better!). Buy it here. This is one I have featured before here, when Helen Moss kindly guest-posted. 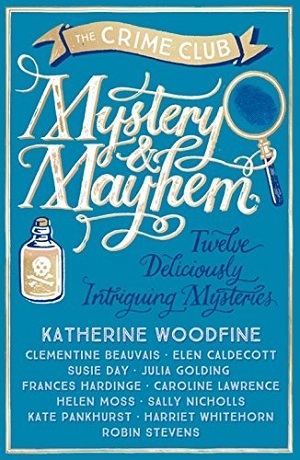 This is a sumptuous book of mini-mysteries from many of the authors featured today, so the reader can have a sample of small mysteries (which are easy to solve by the reader) and find out which author’s style they like. My favourite, The Mystery of the Green Room by Clementine Beauvais. Try also Helen Moss, The Adventure Island and Secrets of the Tombs series, Lauren St John, The Laura Marlin Mysteries, and Katherine Woodfine, The Mystery of the Clockwork Sparrow. Space Books: Because there’s a solar eclipse happening!